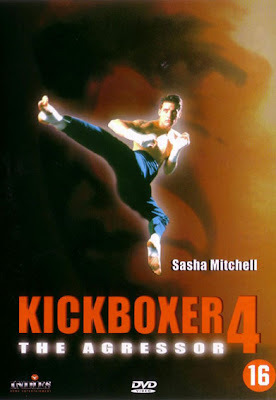 This is my favorite of the Kickboxer series. It's got the right mix of gritty and weird humor, even though it does seem a bit jumbled at the end. IIRC they kill off David Sloan in a newspaper headline in the next film, which is also hilarious. The last 30 minutes is by far the weakest part of the film. But I liked it! Also, how about one on Mean Guns since you seem to be in a Pyun mood? Man i love this blog. Full on nostalgia happening now. Thanks for all your effort. I'm waiting for the complete Bloodfist franchise on DVD, so Bloodfist 6 might happen! Is it your favorite? I've been thinking of Mean Guns for a while. One evening it might be a perfect movie to watch. I like it a lot. "Pyun really tries hard with his meager budget to go back to the seriousness of the old movies and he almost succeeds!" "Here another of Pyun's trademarks shows up: the quirky, off-beat comedy - which is an odd thing in a movie like this, but when the budget is so low and the shooting schedule probably was shorter than a normal working week, it just adds some odd charm to the story. The scene where Tong Po tries to play sitar is both fun and unexpected." Odd choice of instrument......but is it better then Steven Seagals country songs in Fire Down Below (1997)? "My biggest problem with Kickboxer 4 is the last half hour. I'm pretty sure it just wasn't time to choreograph and shoot a better fight, but even with Pyun's standard it's pretty weak - and sloppily made. After some slow-moving pre-fights in the main arena, the end fight is basically David and Tong Po stumbling around in the garden (and on a dinner-set long table) in a very not-so-impressive "fight"." That doesn´t sound too good.....the reason I mostly watch these films, is because of the chance to see some nice fighting. "But what makes it interesting for us pyunboys is the atmosphere. The editing, the music, the noir-ish voice-over in the beginning. That special, almost surrealistic and poetic form of filmmaking that Pyun is unique for. I doubt others will see it, but we who have lived with the guy for our whole lives can smell it, sense it. That's what makes even a very generic kickboxing-film like this interesting." Damn ninja.....you really dig this Pyun guy...? Well, I might have to check out this one out, and other films by Pyun. Good review, and thanks ninja. I used to love Bloodfist VI but no idea how it'll be today. Still, the Dragon saves America from nuclear devastation if i remember correctly so it can't be all bad :) Also had a huge crush on Cat Sassoon. So hot as the villainess.